Indian summer showed up this morning and told me that I should head out back and pick what little remained of my vegetables garden. I sensed that the fall weather would soon spell the end of this growing season, especially for those sun-loving Mediterranean crops such as tomatoes and pygmy aubergine. Any simple garden can contain the basic ingredients for good fun and healthy lifestyle. Tomatoes, peppers and chilis are super versatile ingredients that can be used to as a base upon which to build. So today , I talk about basics. Brushetta making is like painting on a canvas. You start with a blank one, and add ingredients. The the simplest, and tastiest is a simple drizzle with homemade wine vinegar and olive oil. From there you can imagine toppings only limited by imagination and creativity. Have you seen pizzas these days ? Same rules apply to brushetta. Fresh Vegetable Garden Freselle Brushetta and PeppersThis is a very quick plate that is perfect for lunch on hot summer days, eaten on the deck with a glass of very fruity and chilled white wine such as a Pinot Grigio, Sauvignon Blanc or , a Fiano d'Avellino, one of my favorite southern Italian whites. This item is traditionally offered as part of the antipasto, just make sure that you leave room for the other courses. Fresh peppers (hot, sweet, green, yellow , orange and red) , right off the plant. The fan club muched this one up by the time I rinsed the mixing bowls. I guess they really liked the dish. Nothing difficult here. Cut up the tomatoes in medium sized chucks. Toss with EVOO , S/P. add balasmic . Place on top of the freselle or toasted bread. Before I forget, you can find out more about freselle at freselle.it. This is a classic base risotto to which myriads of other ingredients and flavors can be added. Just imagine mixing in sauteed lump crab meat or lobster tails, spring baby peas and some tender speck from Trentino, and a drizzle of truffle oil. There are three secrets to a well made risotto. First the rice. You must use Arborio or better yet a Carnaroli rice, both easily found at your local Italian specialty shop. The second patience. Cooking risotto is a nothing more than a patient ritual of slow cooking of rice grains to which liquid, water or lite stock, is added in small doses. Unlike pasta which requires large proportions of liquids, when risotto is made, grains are forced to slowly absorbs the liquid. As a result, starches are not lost yielding a natural creaminess. The third, never ever overcook the rice. Once again , never ever overcook the rice. The fan club shouted: "The rice is soooo good" , I replied, it's not rice, it's risotto. Pour in 1/2 of the stock. stir frequently,but not continuously. Keep in mind that we are not churning ice cream or butter. When mostly absorbed , add the remaining stock. Repeat the same process for the water, allowing the rice the absorb small doses of water . As you stir the rice, occasionally taste for texture. If you find the rice is al dente you are near completion. At that stage , mount with butter, and parmiggiano over low heat, stir for just a few more minutes. The rice should be creamy and should coat the back of a spoon. This dish needs to be experienced piping hot. Do not let it sit. S/P/EVOO, garlic crushed, not minced. Rating: This is one of the fan club's favorites so the results were expected. On my end, scallops are things you eat only 3 of. A few tricks you should know about scallops. Freeze your scallops so they can be easily cut. Your skillet needs to be as hot as possible for an immediate searing effect. Dice your butter into little cubes, and precision "bomb" the skillet to direct the browning effect. Serve hot, do not let cooked scallops stand too long. 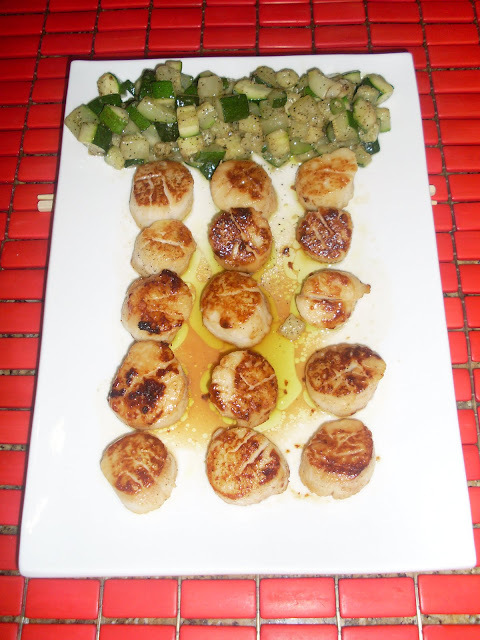 Scallops will release their moisture rather quickly , even after searing and if they do so , they will toughen up. Scallops are perfect for entertaining. Try serving directly from the skillet to your guests plates as they gather around the island. It's lots of fun. For added flavors, create some flavored oils such as sweet yellow peppers or mild basil pesto. Guests can use these as desired. As for the zucchini. Another basic here. Quickly sautee' . Do not overcook, season appropriately If you really want to kick them up, try adding some fresh zucchine flowers. They are hard to find but certainly worth it. Today's Lesson: Sometimes you need to practice your basics, before reaching for the stars.